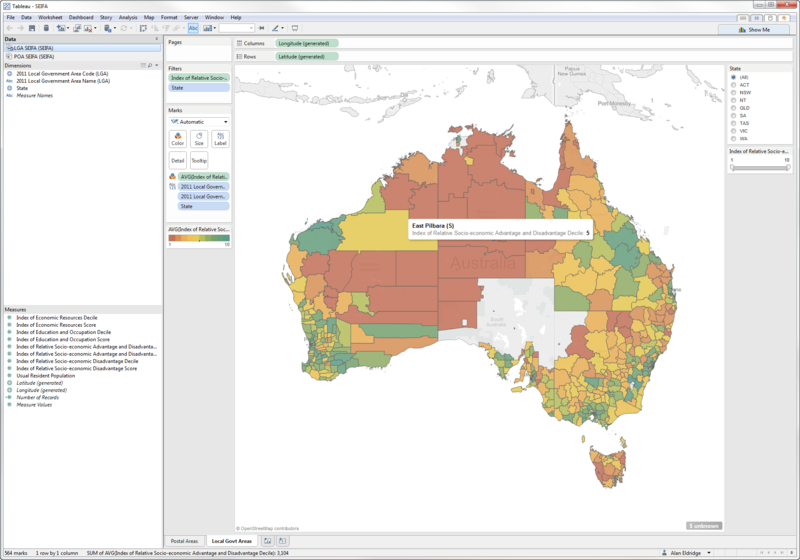 The Tableau product team continues to deliver the goods for Australian users. Another quiet feature release, this time in 8.2.2, allows us to plot LGAs out of the box both as points as well as filled maps. The trick is that the associated geographic role is “County” – hopefully the UI labels will be adjusted in a future release. Simply set your LGA field (either names or codes are recognised) to the County role and then drag and drop to render as a map. You can download the workbook (which also shows the same data by postcode/postal area) from here. I was going to upload this to Tableau Public but it seems that the LGA data isn’t working up there yet… only the postal areas. Thanks Alan. I’m trying to get the ACT to come up on my maps, but I can’t find it on mine or yours – the LGA name is “Unincorporated ACT”. It looks like none of the unincorporated areas are included – is that correct? Is there a way around this? 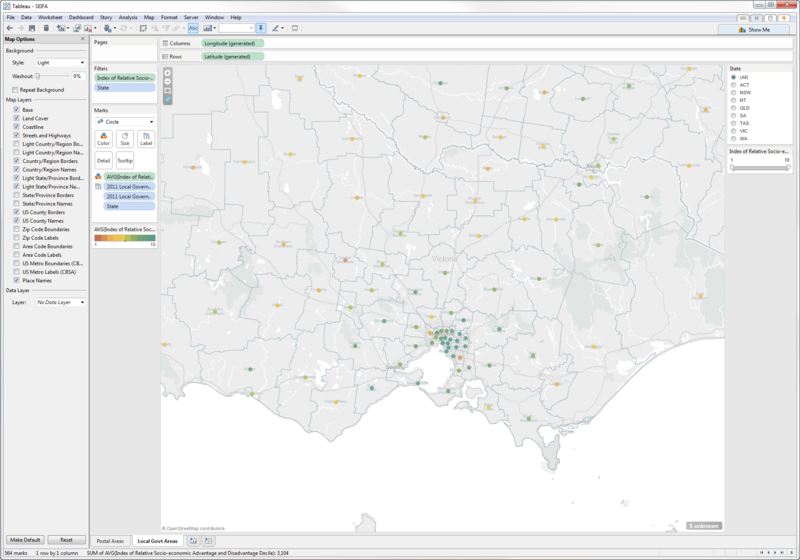 I am trying to do a dashboard that has ACT data, so will need to continue using the custom shapefiles if so. Hi Frances – thanks for the question. I noticed this when the feature was first delivered and it looks like the product team have used the original edition of the ASGS LGA specification from 2011. This is different from the current specification which was published in 2014 – most noticeably was that the “unincorporated” area were not defined and were just left as blank. I have raised a bug on this so hopefully it will get updated. The LGA boundaries in the custom polygon files are based on the 2014 specification. I noticed that the Sunshine Coast Regional Council is not there, nor does it show up in version 9.2 with my own data set. Any idea when it will get incorporated or a workaround? It’s working for me. I copied the list of QLD LGAs from the ABS website and pasted it into Tableau and “Sunshine Coast (R)” and “Sunshine Coast” plot successfully as a centroid and as a filled region. Perhaps your label of “Sunshine Coast Regional Council” isn’t being recognised, in which case you need to “edit locations…” to fix the unrecognised value. I’m brand new to Tableau so I’ve a lot to learn. However I am having a problem with Mapping Flinders (S) QLD LGA as a filled (?) map. It comes up as ambiguous and asks for the Latitude and Longitude. When I enter that I just get a dot. Central Highlands is also another I had a problem with, though that one did map the LGA correctly when I entered the latitude and longitude. Using Version 10.1.1 and can’t upgrade thanks to our IT section. If you are using Tableau 10.1 then then built-in LGA boundaries are based on the July 2015 edition of this standard. If you use Tableau 10.2 then the LGA boundary data has been updated to the July 2016 edition. b) try using the LGA code instead of the LGA name to make sure there isn’t a minor mismatch causing your problem.